The tomb of Tutankhamun contained four gilded shrines nested one inside the other in order of decreasing size. Inside the innermost shrine was a red quartzite sarcophagus which protected three anthropoid coffins (man-shaped). The first two coffins were made of gilded wood but the final coffin was made of solid gold. 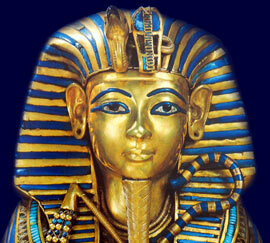 The solid gold coffin housed the mummy of King Tut and his fabulous golden death mask. This page describes the King Tut Sarcophagus. The Ancient Egyptian Sarcophagus is synonymous with the famous artefacts found in the tomb of King Tut. What exactly was the King Tut sarcophagus and what was its purpose? Definition (plural: sarcophagi) : A sarcophagus is a stone container that usually houses a coffin and an Egyptian mummy. The word sarcophagus was applied to stone coffins in general which were not sunk underground. The Egyptian interpretation of the word sarcophagus was the 'possessor of life' relating to their belief in the afterlife and that the deceased would eventually be reborn. Western culture has the opposite interpretation believing that a sarcophagus is a 'possessor of death'. During the 18th Dynasty the outer sarcophagus enclosed a series of inner coffins, the last of which would contain the royal mummy of the Pharaoh. The purpose of the King Tut sarcophagus was therefore the external layer of protection for the royal mummy of Tutankhamun. Inside the King Tut Sarcophagus were 3 nested layers of coffins. These coffins are described as Anthropoid meaning man-shaped. This term is therefore used for coffins made in the shape of a human. The King Tut sarcophagus was highly decorated with ornate carvings and paintings and carved with hieroglyphs and relief's, both internally and externally. It contains three gold Anthropoid coffins nested within each other, like Russian dolls. Inside the final coffin is the mummy of the Pharaoh Tutankhamun - King Tut - which was directly covered by his fabulous death mask. Each section of this King Tut website addresses all topics and provides interesting facts and information about the Golden Age of Pharaohs and of Egypt. The Sitemap provides full details of all of the information and facts provided about the fascinating subject of the Pharaoh Tutankhamun.